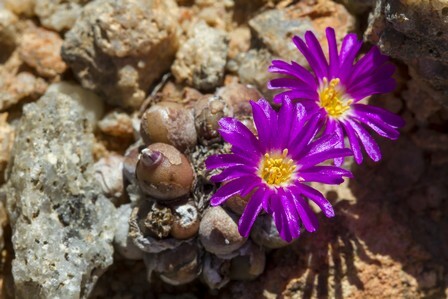 Conophytum brunneum is a localized (EOO and AOO <1 km²), but locally abundant species that is potentially threatened by overgrazing and trampling. Partially shaded, west-facing quartzitic or sandstone slopes. Plants occur on land that is used for livestock grazing. Habitat degradation as well as trampling is a potential threat. It is an unusual species and may also be potentially targeted by succulent collectors. Plants occur in scattered clumps on hills across two adjacent farms. It is locally abundant in suitable habitat. There are four known subpopulations, and each consists of more than 2000 plants. Hartmann, H.E.K. 2002. Illustrated handbook of succulent plants: Aizoaceae A-E. Springer, Berlin. Wagner, G. 2002. Conophytum brunneum S.A. Hammer spec. nov. Mesemb Study Group Bulletin 17(2):26-27.